← Ruffle, David. Sherlock Holmes and the Lyme Regis Horror. (Expanded 2nd ed.) London: MX Publishing, 2011. My last review was devoted to Ruffle’s novella, “Sherlock Holmes and the Lyme Regis Horror.” However, his book contains plenty more. Let’s have a look, shall we? Watson must be talking about cricket again…. Watson is to cricket as George Will is to baseball. 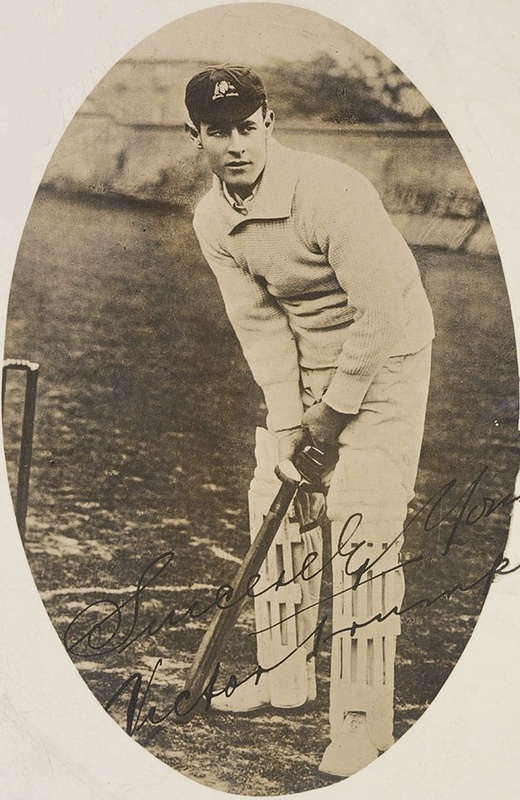 For him, the sport is the embodiment of everything that is good about the British Empire: “honour, an inherent sense of duty and fair play,” as he declares in “Horror.” So when famed Australian batsman Victor Trumper shows up at 221B, asking Holmes to look into a kidnapping threat, he’s both shocked and eager to help. “The Trumper Affiar” (previously published as an e-pub on Amazon) is a solid story, written along more traditional lines than “Horror.” Ruffle provides accurate historical details, both in the setting and characters (actual cricket players), and his end notes are a nice touch for history aficionados. 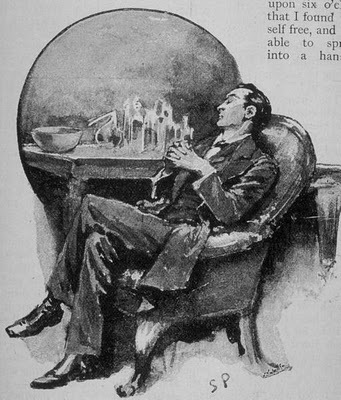 Holmes and Watson are also nicely in character and we’re treated to some nice running jokes as Watson continually bores the Great Detective (and occasionally the reader) with lengthy explications of cricket matches, and Holmes finds that the doctor’s novelistic touches have given him some unexpected anonymity. The story is not as atmospheric as “Horror,” but Ruffle performs a very nice sleight-of-hand in concealing the villain, the denouement is darker for its realism, and the ending is quite poignant. Ruffle takes us back to the supernatural in “The Mystery of Loch Ness” and “The Runes Affair.” In the former, a gruesome death forces the reader to apply Holmes’ famous maxim, “that when you have eliminated the impossible, whatever remains, however improbable, must be the truth.” In “The Runes Affair,” three highly nervous paranormal researchers ask Holmes to help them fend off what seems to be an evil author’s attempt to exact vengeance for poor reviews and rejection slips through supernatural means. Holmes and Watson take on the case to assuage the mens’ fears and meet with unexpected results; one has to wonder whether they might have been manipulated into unwittingly carrying out revenge themselves. Other stories have a supernatural bent as well. Set in more modern times (the 1930’s and the recent past, respectively), “Forever 1895” and “A Lyme Ghost Story” suggest that Holmes dislikes partiers and inappropriate over night guests, but has a soft spot for pastiche writers. “Timeless in Lyme” is not about phantoms…at least from one perspective. In each of these pieces, Ruffle mixes past and present with the deft touch essential for a satisfying ghost tale. Christmas is another favorite topic. In “Christmas at Baker Street,” Holmes explains to Watson the very best reasons for refusing a knighthood. He exposes even more of his heart in the incredibly charming “Henrietta’s Problem,” giving credence to Jeremy Brett’s view that “Holmes loved children.” My personal favorite in this collection, however, is “Christmas with Holmes,” which has an aging Holmes and Watson spending the holiday together in Sussex in 1916. The end scene is beautiful and while I realized, upon a third reading, that it could have a darker interpretation, I’ll go with my first, sad-but-fitting one. Ruffle ends the book with a lovely poem dedicated to his son, Duncan. So, my final conclusion? Sherlock Holmes and the Lyme Regis Horror is a well-written collection with “the charm of variety,” deserving of a place on your bookshelf or in your e-reader. I look forward to reading more of Ruffle’s work. Sherlock Holmes and The Lyme Regis Horror is available from major online booksellers, and is offered on Kindle. “The Trumper Affair” is available as a solo work on Kindle as well. You can also buy the book directly from MX Publishing, or from independent bookstores such as Poisoned Pen.